My mother brought back something pretty special for me from her Argentina trip. 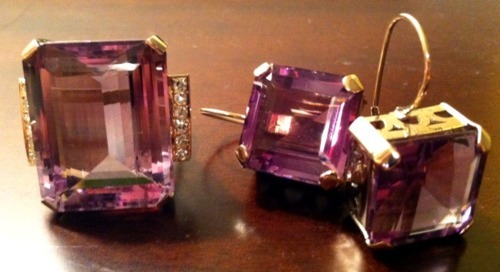 For my birthday (which isn’t actually til Monday, BTW), she presented me with these gorgeous vintage Amethyst earrings and a superbly enormous Amethyst + Diamond cocktail ring. Yes, it is as big as it looks. Sorry ladies, I don’t have a link to these 1940’s stunners – they’re one of a kind!